Haliwel is a Wisconsin-based five-piece hard rock band, and they are a force to be reckoned with for 2016. Haliwel saw success with their first release in 2014, “From the Inside,” which was a complete DIY (Do It Yourself) album. We will see another DIY effort from the band with the much-anticipated December 2015 release of “Pandemic,” an album that takes a major step forward for the band. On “Pandemic” you will hear the familiar sound that is Haliwel: riff-driven instrumentation with moving lyrics and catchy melodies, but now with a darker, more refined sound. Haliwel was formed in 2011, and the band started working on songs immediately and had enough material for the full-length album “From the Inside” within a few months; a couple of the songs on “Pandemic” were also created during these early sessions. “From the Inside” was finally released in 2014 and it brought Haliwel onto the scene with a bang. 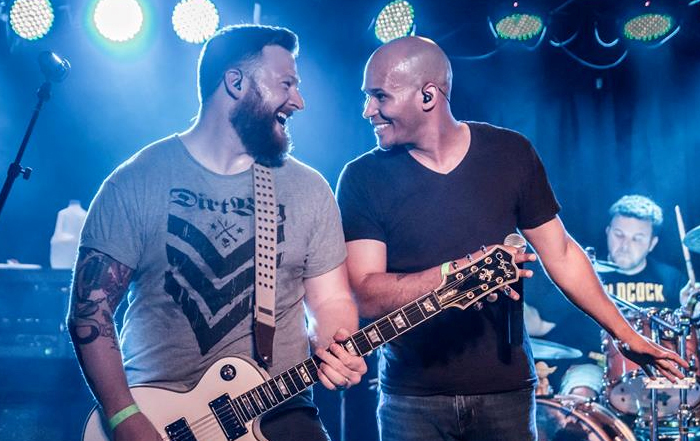 After their first few shows, Haliwel started sharing the stage with national bands such as Framing Hanley, Nothing More, and Ra. “From the Inside” captured the attention of radio stations, both internet and terrestrial. Haliwel was granted radio station takeovers, live acoustic performances, and they were even asked to host their own two hour radio special. “The Only One,” the lead single from “From the Inside,” was awarded “Song of the Year” in 2014 by Max Ink Radio. The band’s follow-up release, “Pandemic,” features many different levels of “heavy,” from the slow and heartfelt ballad “My Letter,” to the intense and driving “Crack in the Frame.” Look for the lead single “The World Over” to break Haliwel into new levels of success for 2016.